First of all, SOZ that I’ve been such an awful blogger lately. I’ve had a hectic few weeks with work and have been traipsing all around the country. You might think that being on the open road and staying in hotels could give me plenty of time for creating content, but in case you were wondering where the inspirational hubs of the UK were, it turns out Chorley and Basildon are not them. Who’d have thunk it, honestly. However, I am now back to a normal routine from today, and so hopefully this means plenty of regular blogging again. 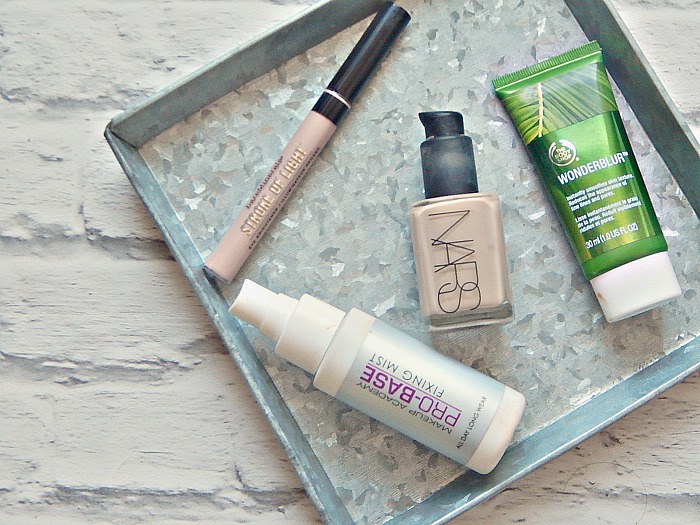 I thought I would kick off with a quick look at my current favourite products for a near-perfect base. First of all, a primer is a must. My current favourite is still Body Shop’s Wonderblur, which fills in my pores nicely and gives my base an even, velvety finish. It’s from the Body Shop’s Drops of Youth range (which I reviewed here) and so is also perfect for mid-2os skin. For my day-to-day foundation, I’m still loving NARS Sheer Glow – even more so now that I bought a pump and so am over the pure rage I experienced when I first bought Sheer Glow. The key to a good base is getting a coverage that you’re happy with – for me, Sheer Glow strikes that balance between being quite full coverage but not looking cakey. This stuff looks flawless in the morning, and while it doesn’t hold up as amazingly as some other foundation as the day goes on, with the right setting spray it stays looking really good. Because the coverage of Sheer Glow is so good and my skin is behaving quite well at the moment, I actually don’t need a concealer for blemishes right now. Because of this, I’m getting by just perfectly with Bare Minerals Stroke of Light brightening concealer*, which is a new favourite in my makeup bag. I think it’s important to ensure there’s some dimension to your base even before you go in on the contouring, and so something like this is perfect. Applied underneath the eyes, down my nose and on my brow bone this brightens up my face and prevents the base looking too flat. Finally, I think the last step in the quest for the perfect base should be a setting spray. I really notice the difference on days where I forget this step – it’s hard not to, with my nose shining like a beacon and my eyeliner crawling up my eyelids. I can’t believe I used to just rely on powder to stop my makeup sliding off too much in the day; now I swear by a fixing spray and this cheap Pro Base Fixing Mist from MUA honestly does the job brilliantly. These are my favourite base products, but what do you recommend? Let me know in the comments! Definitely want to try the body shop wonderblur! !